The Dallas Cowboys beat the Oakland Raiders in a wild final minutes. The Raiders appeared to have a shot at overtime, at worst, but lost when Derek Carr stretched for a touchdown. 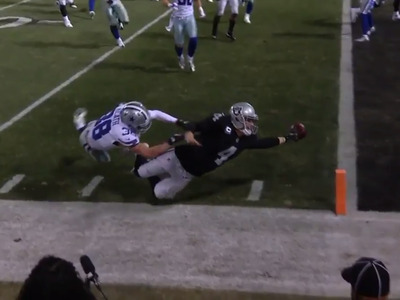 Carr fumbled the ball into, and out of, the endzone, causing a turnover and effectively ending the game. The Oakland Raiders suffered what was likely the most heartbreaking loss of the NFL season on Sunday night. First, with the game tied 17-17 nearing the end of the fourth quarter, the Cowboys were able to keep a drive alive against the Raiders with the help of a controversial fourth down measurement that involved the referee using a folded index card to determine whether or not the runner had converted the first down. After the call, the Cowboys were able to keep that possession alive and score the go-ahead field goal with just 1:44 left in the game. With the Raiders running a two-minute drill, Derek Carr was able to lead the offence into the red zone thanks to a 55-yard pass interference penalty call. A few plays later, Oakland was facing third-and-three just eight yards from the game-winning touchdown. Carr took the snap, and as the play broke down, decided to run for the first down, but rather than sliding after he had comfortably secured a new set of downs for the Raiders, Carr choose to dive for the pylon, a decision that would cost Oakland the game. As Carr was in the air stretching for the end zone, he was hit by a defender, which knocked the ball loose from Carr’s grip and tumbling through the end zone and out of bounds. You can watch the wild final moments play out below. Not only did the fumble save the Cowboys, also saved Cowboys bettors. Dallas had been favoured by three heading into the game, and the 20-17 win ensured that those that picked the Cowboys would get their money back with a push. For the Raiders, it’s one of the hardest ways that you can imagine a team losing a game – especially considering that had Carr simply slide for the first down then Oakland would have had another shot for the win and would be left with just a chip shot to force overtime. Additionally, in Week 10, Bears’ head coach John Fox threw the challenge flag after running back Benny Cunningham was called short of the end zone after diving for the line. The original call was overturned, but rather than the Bears scoring a touchdown, the referees determined that Cunningham had lost control of the ball, meaning that Fox’s challenge actually lost his team possession. With such a specific and contentious rule getting so much attention in recent weeks, don’t be surprised if the NFL rules committee decides to look into adjusting what happens when a ball is fumbled out of the end zone during the offseason.